Fusarium Basal Plate Rot of Onion in 2016 | Chatham-Kent Agriculture Development | We Grow For the World! Basal plate rot is beginning to show up in some onion fields in Ontario due in part to the warm 2016 growing season. The causal agent of basal plate rot, Fusarium oxysporum f.sp. cepae, is not new to Ontario. It is a persistent soil-borne organism that can also contaminate onion sets or cloves of garlic used for seed. In fact it is most likely introduced into non-contaminate fields on infested garlic cloves or onion sets. The disease tends to occur more frequently on Spanish onions varieties than on yellow cooking onion varieties. The pathogen infects when soils become very warm. Interestingly, even in heavily contaminated fields the disease rarely occurs when soil temperatures are below 15oC. However as the soil temperatures warms up and approach 25-28oC together with hot conditions like what is being experienced in many regions of Ontario during 2016, the spores of the pathogen in soil germinate, infect developing bulbs and the disease becomes more prevalent and severe. Symptoms of this disease are often seen as early senescence of the infected plants. The tips of leaves of infected plants turn yellow then brown as symptoms progresses downward towards the bulb. Occasionally a reddish discolouration may appear on bulb sheathes of severely infected garlic plants early in the season. During very hot and dry conditions infected plants wilt and bulbs appear watery and brown. Often the roots rot off of the basal plate (Figure 1). Severely infected plants are easily removed from the soil when pulled, leaving the rotted basal plate and roots behind. A white mold is sometimes observed growing on the basal plate and occasionally orange to salmon coloured spore masses develop around the rotted basal plate (Figure 2). Bulbs that appear to be free of symptoms at harvest but are infected can decay in storage, however, there is no evidence that the disease spreads from bulb to bulb during storage. Figure 1. 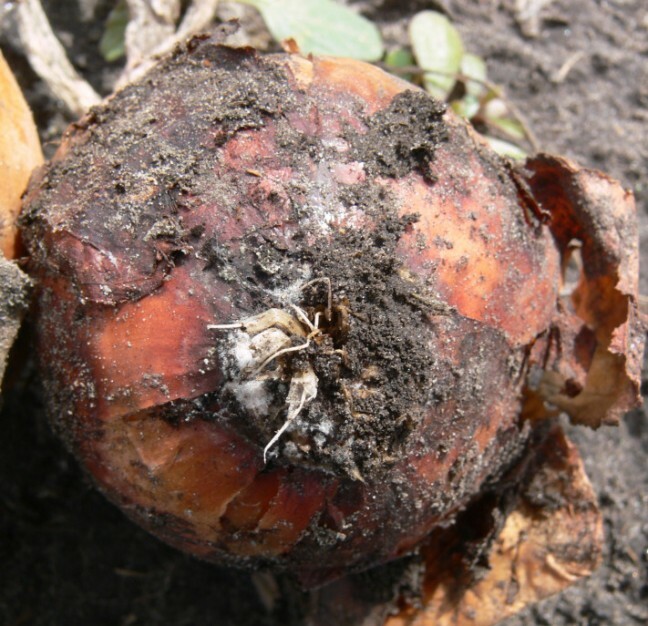 Roots often rot off of onion bulbs infected with Fusarium Basal plate rot. The pathogen can infect onion or garlic bulbs directly at any stage of plant growth, however, a higher incidence of infected plants tends to occur when roots, bulbs or the basal plate are wounded by insects, nematodes or other pathogens. In garlic, the disease looks a lot like and is often associated with bulb and stem nematode injury where as in onions it is sometimes associated with onion maggot damage. The disease is managed effectively by crop rotation with non host crops for 4 years and through planting vigorously growing onion and garlic varieties that are resistant to this disease.